85 Deluxe Rooms measuring 28 sqm featuring modern design style offer guests comfort and convenience away from home. 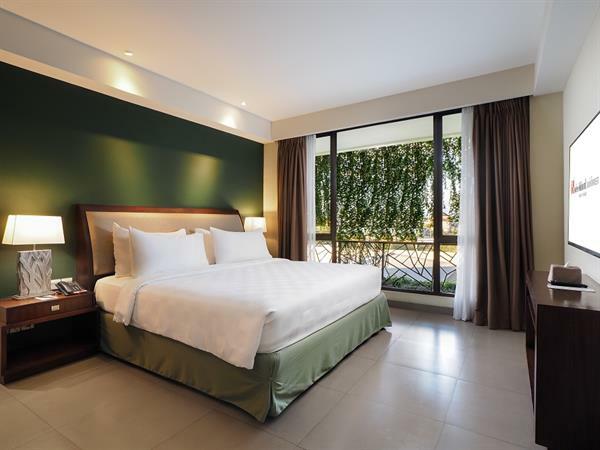 The grand deluxe rooms measure 32 sqm designed with a modern touch in either king size bed or twin bed configuration; the rooms offer a spacious setting. Suitable for a family, measuring 50 sqm the 6 Junior Suites feature a large living room area connected to the bedroom. Located to overlook the hotel's courtyard, the Executive Suites embrace a stylish and comfortable décor.